Head circumference is without a wig except where mentioned. The brim of this Lady Doll straw hat is turned up on the left side and may be finished on the inside with ruched net or lightweight silk. A ribbon, twisted in several places, may be added around the crown, and a looped bow and feather can be used to trim the front of the crown. 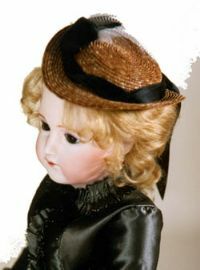 This hat fits a 22-24 inch lady doll with a head circumference of 10-11 inches. Requires 10 yards of 1/4 inch hat braid, sold separately or as part of a kit. 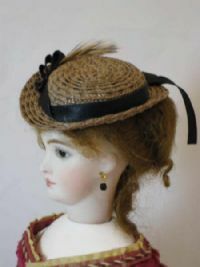 This 1870-1890 period hat styled for Fashion Lady dolls has sides that are tipped down. The crown is flat and may be decorated with a twisted ribbon around the crown, ending in a bow in the back. Feathers and a bow may decorate one side. 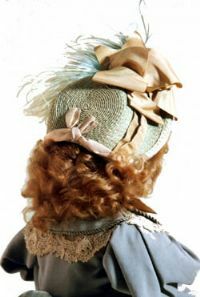 L003 for 19 inches Fashion Lady with a head circumference approximately 9 inches requires approximately 9 yards of 1/4 inch hat braid sold separately or as part of a kit. 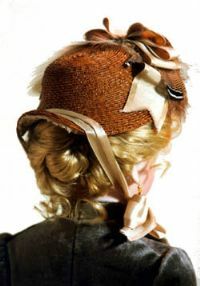 L003-A for Seeley's new 11.5 inches Fashion Lady with a head circumference approximately 6-7 inches requires approximately 6 yards of 1/4 inch hat braid sold separately or as part of a kit. 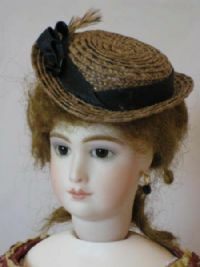 L003-UF for Ultimate Fashion © Doll or 12" French Fashion Doll requires 5 yards of hat braid sold separately or as part of a kit. Now available to fit Alice Leverette's Ultimate Fashion© Doll or any 12" French Fashion doll. 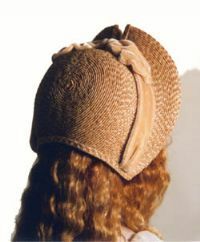 This hat requires 5 yards of /4 inch hat braid sold separately or as part of a kit. 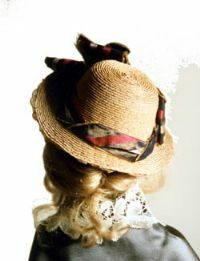 The front brim of this classic straw hat is tipped back and a V section is cut into the center of the brim. It may be decorated with gathered velvet to coordinate with the dress, or made from the same goods as the costume. The crown is slightly rounded on top and the same fabric may be used to form a ribbon around the crown and a bow in the center. C023 for 18-inch child or a 19-20 inch Fashion Lady dolls. Head circumference is approximately 9-10 inches. Requires approximately 12 yards of 1/4 inch hat braid sold separately or as part of a kit. C023-A for 13-14-inch dolls with a head circumference of 8 Inches. Requires approximately 12 yards of 1/4 inch hat braid sold separately or as part of a kit. This size fits Rosette, Bleuette's older sister, or any doll with a head of 8 inch circumference. C023-B for 10 inch dolls with a head circumference of 6.25-7.25 Inches. Requires approximately 10 yards of 1/4 inch hat braid sold separately or as part of a kit. It also fits Bleuette.